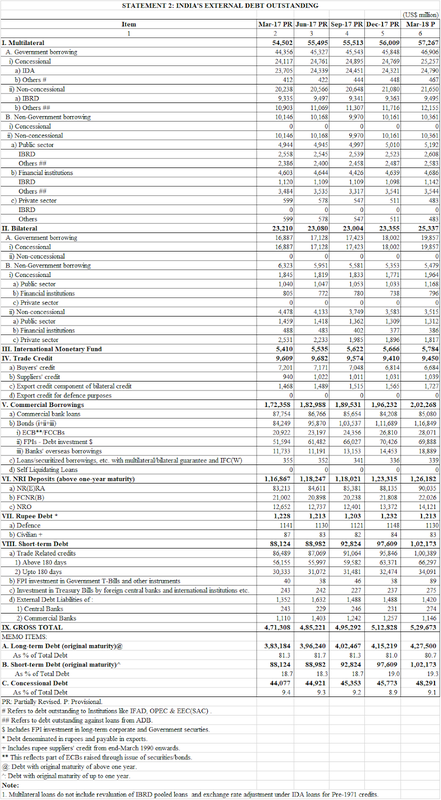 Jun 29, 2018: As per the standard practice, India's external debt statistics for the quarters ending March and June are released by the Reserve Bank of India with a lag of one quarter and those for the quarters ending September and December by the Ministry of Finance, Government of India. 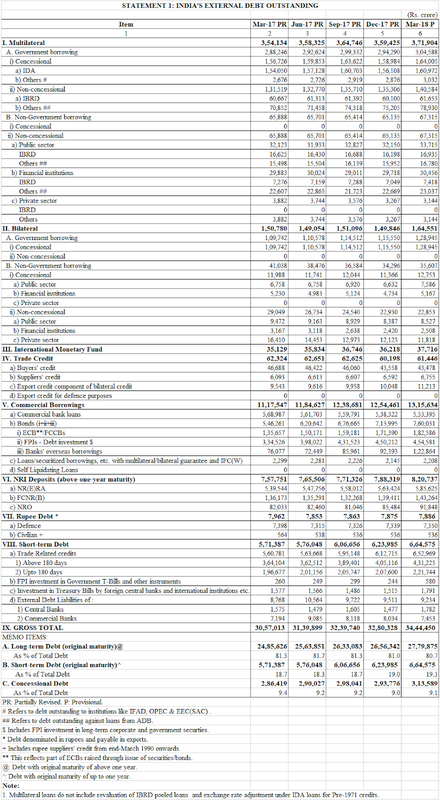 The external debt data as at end-March 2018 in rupees and US dollars as well as revised data for earlier quarters are set out in Statements 1 and 2, respectively. 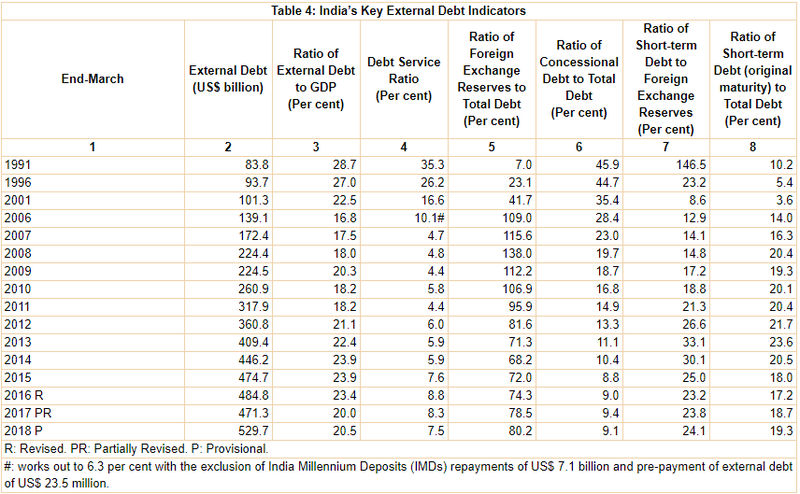 The major developments relating to India’s external debt as at end-March 2018 are presented below. At end-March 2018, India’s external debt witnessed an increase of 12.4 per cent over its level at end-March 2017, primarily on account of an increase in commercial borrowings, short-term debt and non-resident Indian (NRI) deposits. The increase in the magnitude of external debt was partly due to valuation loss resulting from the depreciation of the US dollar against major currencies. The external debt to GDP ratio stood at 20.5 per cent at end-March 2018, higher than its level of 20.0 per cent at end-March 2017.
o At end-March 2018, India’s external debt was placed at US$ 529.7 billion, recording an increase of US$ 58.4 billion over its level at end-March 2017 (Table 1). o Valuation loss due to the depreciation of the US dollar vis-à-vis major currencies (viz., euro, SDR, Japanese yen and pound sterling) was placed at US$ 5.2 billion. Excluding the valuation effect, the increase in external debt would have been US$ 53.1 billion instead of US$ 58.4 billion at end-March 2018 over end-March 2017.
o Commercial borrowings continued to be the largest component of external debt with a share of 38.2 per cent, followed by NRI deposits (23.8 per cent) and short-term trade credit (19.0 per cent). o At end-March 2018, long-term debt (with original maturity of above one year) was placed at US$ 427.5 billion, recording an increase of US$ 44.3 billion over its level at end-March 2017.
o The share of long-term debt (original maturity) in total external debt at end-March 2018 was 80.7 per cent, lower than its level of 81.3 per cent at end-March 2017.
o The share of short-term debt (with original maturity of up to one year) in total external debt increased to 19.3 per cent at end-March 2018 from 18.7 per cent at end-March 2017. The ratio of short-term debt (original maturity) to foreign exchange reserves increased to 24.1 per cent at end-March 2018 (23.8 per cent at end-March 2017). 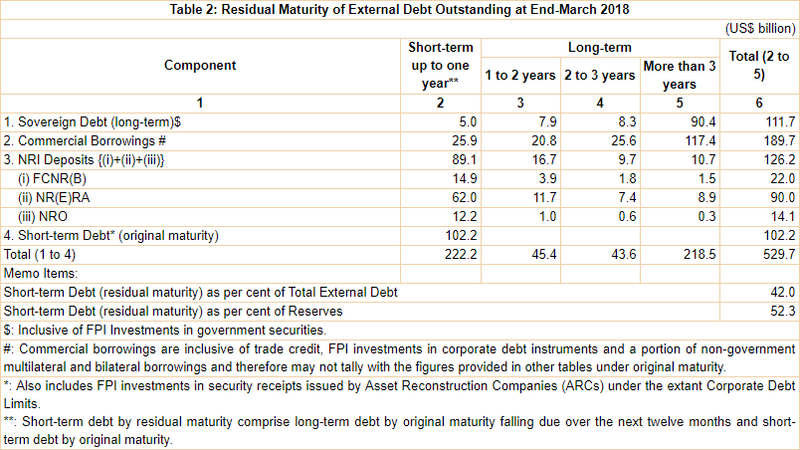 o Short-term debt on a residual maturity basis (i.e., debt obligations that include long-term debt by original maturity falling due over the next twelve months and short-term debt by original maturity) constituted 42.0 per cent of total external debt at end-March 2018 (41.6 per cent at end-March 2017) and stood at 52.3 per cent of foreign exchange reserves (53.0 per cent at end-March 2017) (Table 2). o US dollar denominated debt continued to be the largest component of India’s external debt with a share of 49.5 per cent at end-March 2018, followed by the Indian rupee (35.8 per cent), SDR (5.5 per cent), Japanese yen (4.8 per cent) and euro (3.4 per cent). 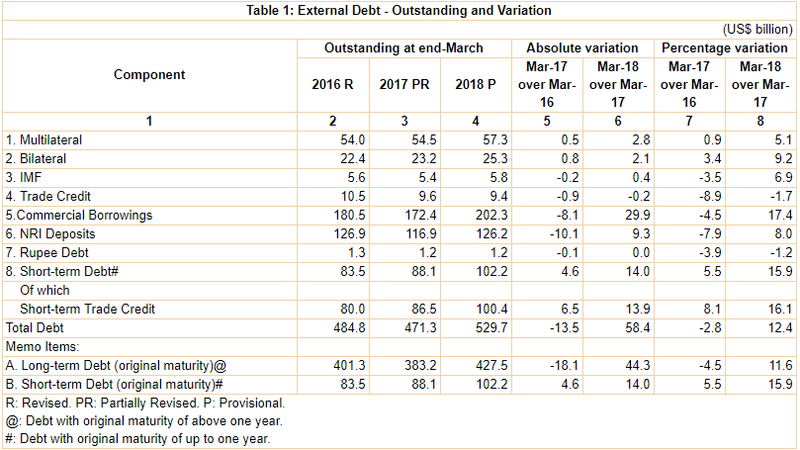 o The borrower-wise classification shows that the outstanding debt of both government and non-government sectors increased at end-March 2018 (Table 3). o Debt service payments declined to 7.5 per cent of current receipts at end-March 2018 as compared with 8.3 per cent at end-March 2017 (Table 4).